Hey ladies! Who’s ready for some warmer weather and a fun and exciting night out on the town? 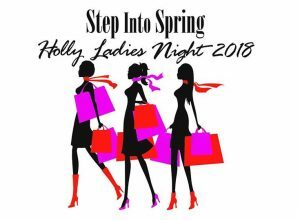 Invite your girlfriends to ‘Step Into Spring’ and join you for an evening of sipping, noshing, shopping, and socializing Friday, April 27th in Historic Downtown Holly. From 5:00 – 9:00 p.m., the Downtown merchants invite you to shop ‘til you drop! In-store specials, enter-to-win contests, giveaways, treats / eats / samples, live music, and SO much more! Plus dinner and drink specials at the eateries, several additional vendors in the street, and a DJ playing your favorite tunes. This event is two weeks before Mother’s Day; it’s a great time to shop for the Moms in your life… and make sure you get yourself a littlesomething, too! The first 500 ladies who visit the Welcome Table (under the tent, in front of The Vault) will receive a fancy FREE purple 24 oz. hot/cold beverage mug. FIVE of these mugs will contain a $100 VISA pre-paid gift card; you might be one of the lucky winners! And don’t forget to enter to win our big raffle basket full of goodies from the Downtown merchants. Car-pooling is *strongly* encouraged as the parking spots in town are a hot commodity! But there will be additional off-site parking with plenty of signage and a FREE shuttle service running throughout the duration of the event. As always, we like to help out our fellow ladies in need. So we’ll be collecting NEW pairs of socks, and shoes / flip flops that will be given to a local women’s shelter; we welcome your donation of these items. Our event theme is “Step Into Spring”. So wear some cute (but comfy) shoes, bring your girlfriends, and spend a memorable evening with us in Historic Downtown Holly. Arrive early and stay late – it’s going to be a ton of fun! Looking forward to seeing all of you lovely ladies Friday, April 27th. Click on the link below to learn more and keep updated! Our Sponsors make this event possible! Please Contact khughes@hollyvillage.org with any questions! We are always looking for smiling volunteers!